2017 has found its spirit animal. 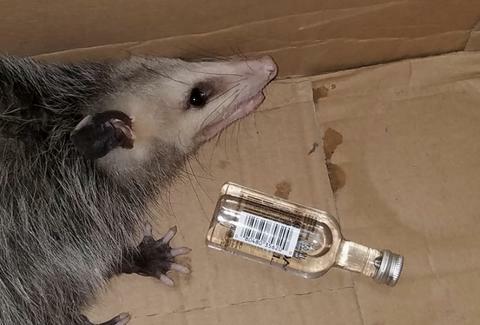 An opossum was found in a Florida liquor store, and it appears to have been drinking. The morning after Thanksgiving, a Cash's Liquor Store employee discovered the animal near a cracked, empty bottle of bourbon. After it was reported, a Fort Walton Beach police officer brought the vagrant to Emerald Coast Wildlife Refuge. "Assuming the opossum drank [the bourbon, the employee] brought her to us," Michelle Pettis, a technician at the refuge, told the Panama City News Herald, "and we looked over her and she definitely wasn't fully acting normal." Pettis, who said this was her first time dealing with an opossum that had been imbibing, added the animal was disoriented, pale, and excessively salivating when it arrived. “We loaded her up with fluids to help flush out any alcohol toxins,” Pettis added. “She was good a couple of days later.” She also told TIME the animal didn't appear to have a hangover. The non-profit refuge, which keeps its doors open through donations, released the unharmed opossum Thursday.